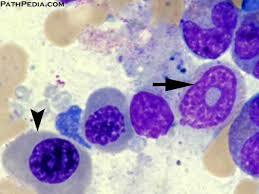 IMAGE: dysplastic red cell precursors, dysplastic granulocyte precursors, blasts 3%. The cytogenetics showed del(7q). This gave him a prognostic score of 3.6 using the IPSS-R, with a predicted survival of 3 years. He was followed in clinic for 18 months, and after 6 months required regular transfusion. On his most recent clinic visit he commented that he felt much more tired, and had developed a few cold sores that wouldn’t heal. Hb 89 g/l, MCV 88fl, WCC 23 x10*9, platelets 23. What is going on now? What tests would you ask for next? Please reply on twitter using #unofficialCSIM2 so that everyone can follow the conversation. Keep following the case to find out what happens to our patient. This entry was posted in Acute leukaemia, Anaemia, Bone marrow failure and tagged anaemia, Macrocytosis, neutropenia, sepsis. Bookmark the permalink.